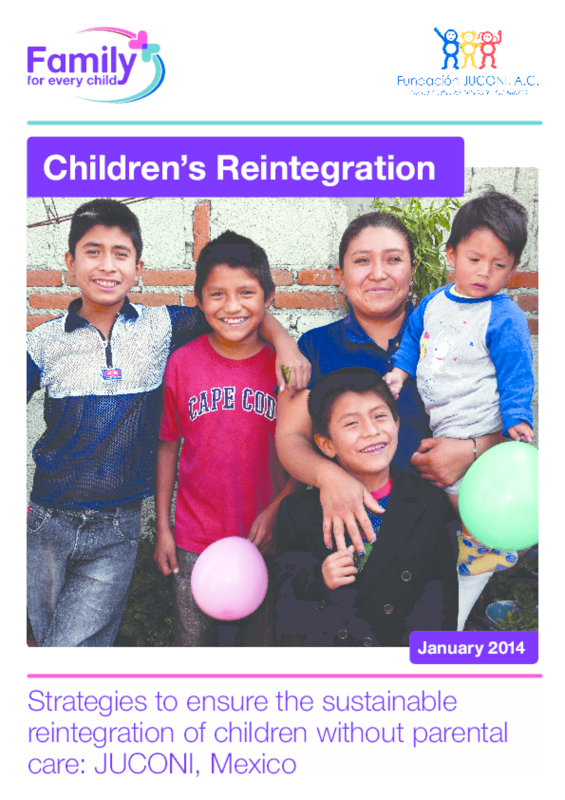 This paper reports on the Mexican arm of Family for Every Child's three-country study on strategies to ensure the sustainable reintegration of children without parental care. It set out to address the question: "What are successful elements in strategies to ensure the sustainable reintegration of children without parental care? ", as identified from a 15-month study on work on family reintegration with boys who have lived on the streets (or been at identifiably high risk of doing so), and their families, in Puebla, Mexico. The study shows that satisfying family reintegration is possible even for boys who have had histories of violence and loss in the context of social exclusion, and in families with transgenerational failures of attachment. However, the 'elements' of successful reintegration cannot be introduced without understanding JUCONI's theoretical foundation. A key recommendation of this study for organisations that work with comparable populations is to explore this foundation, since it could enable them to adapt and develop strategies that are appropriate to their own context. Copyright 2014 Family for Every Child. Copyright holder(s) Family for Every Child , Fundacion JUCONI, A.C.